Embryo to Elephant Museum establishment is the existence of Royal Batavian Society of Arts and Sciences established by the Government of the Netherlands on April 24, 1778. Chairman of the association named J.C.M. Radermacher then donated a building at Jalan Kalibesar, as well as books and cultural objects that became the initial collection of the museum. Raffles then erected a building at Jalan Majapahit No. 3 (now part of the Secretariat of State) for the museum and meeting point for Societeit de Harmonie (Literary Society). Then in 1862 the Dutch East Indies put up the National Museum building, which was opened in 1868. On September 17, 1962, the Cultural Institute of Indonesia handed over the management of the museum to the Indonesian government. Front view of the National Museum that still looks gorgeous. In the courtyard of the first and largest museum in Southeast Asia there is an elephant statue made of bronze as a gift from King Chulalongkorn (Rama V) from Thailand during a visit in 1871. The statue is what makes the National Museum of the Republic of Indonesia, the official name since May 28, 1979, also referred to as Elephant Museum. After paying the entrance fee which was rather cheap, in the first part of the room is the Ethnography Collection, contains many local cultural objects, such as headgear, ethnic sculpture, mask, keris and other traditional deadly weapons, complete set of gamelan, wayang, traditional toys, miniature traditional houses, and actual size of a long boat. Keris is an Indonesian culture listed in UNESCO as World Cultural Heritage since 2005. Keris is often considered to provide certain luck or curse to its owner, such as Keris Mpu Gandring, Kyai Setan Kober, Kyai Sengkelat, Nagasasra and Sabuk Inten and Kyai Condong Campur. Keris can be very dangerous, when it greased with deadly poison. The impressive collection from the past era at the National Museum of Jakarta, known as Ciaruteun Inscription or Ciampea Inscription. The inscription written in Pallawa and Sanskrit was found alongside Ciaruteun River, near the estuary of the Cisadane River, Bogor. In the inscription there are images of spiders and indentation King Purnawarman's footprint. Miniature of Bale Piasan (place for offerings) can be found in this elegant tourist spot, also miniature of traditional houses, and full-sized of wooden boats. There used to be a display of Nini Thowok puppet to summon supernatural spirits. Its head is made from coconut shell, painted with face of bride, the body from rattan and the hands are bundle of sticks. On my last visit I did not see this rare collection. An exquisite collection of the National Museum of Jakarta in the form of beautifully carved antique scales as high as an adult human. These scales were used to pay agricultural tax at the time of the Sultanate of Banjarmasin in South Kalimantan. It is said that the one becoming the weights of the scales is Sultan Banjar himself. Scales is the epitome of fairness and honesty of their owners. Next there is a spacious room with a round marble table, a chandelier, antique cupboards, urns and jars, as well as graceful tiled floors. Most ceramic collections in the museum are from China, Vietnam, Thailand, Japan, the Middle East and Europe. There is plate originated from Edo era of the 17th century, 15th century vase from Vietnam, and drinking jar from 6-7th century of Sui Dynasty. 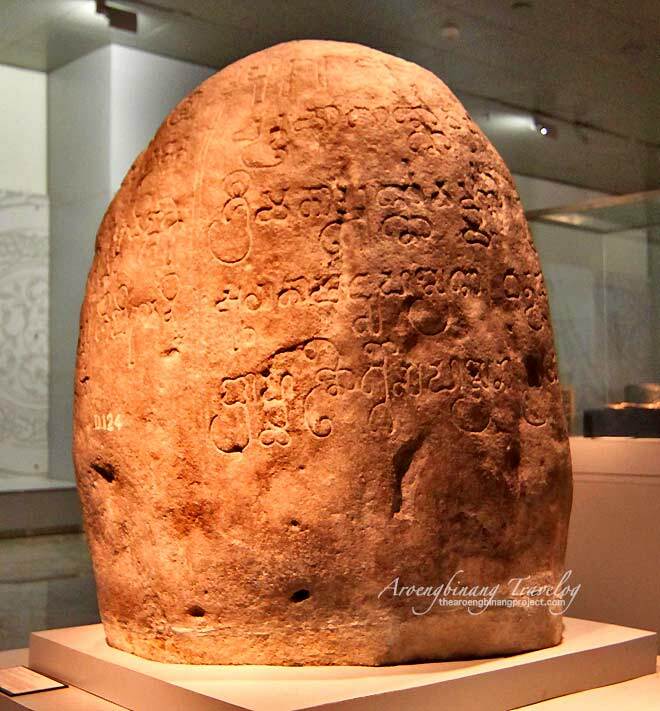 Another very valuable archaeological artefact is the Wurudu Kidul inscription dated 922 AD, Mukhalingga 1283 Saka (1361 AD) from Singasari, Ganesha statues from 8th century origin of Banon temple, as well as a statue of Nandi from 13th century of Singosari origin. There is also a statue Bhairawa as high as 414 cm from 13th century, found in Roco Padang, West Sumatra. 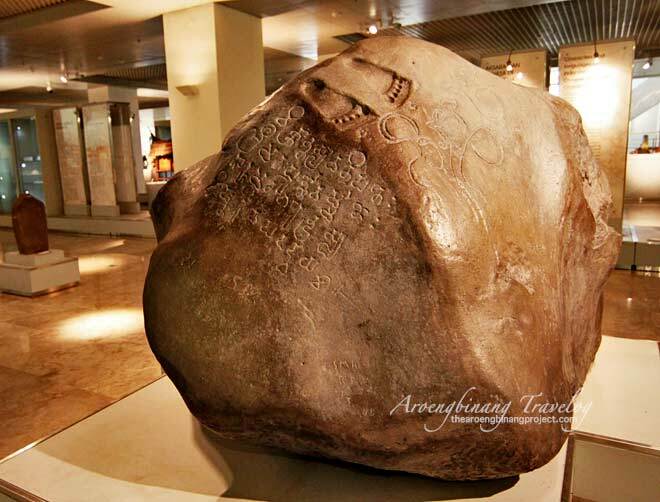 The beautiful inscribed stone in the National Museum of Jakarta is known as Tugu inscription, found in Kampung Batutumbu, Desa Tugu, Tarumajaya subdistrict, Bekasi, which come from the era of Tarumanagara, one of the oldest kingdom that left a historical record. Taruma was dominated the western part of Java Island on the 4th century until the 7th century. There is also the Mulawarmman inscription from Kutai, East Kalimantan, dating from the 5th century. The inscription is one of seven inscriptions carved on Yupa (stone pillars), and is the oldest inscription in Indonesia. The inscription, written using the ancient letter of Pallava or Sanskrit, tells the family tree of Mulawarmman, the greatest king of the ancient kingdom of Kutai. Because of so many statues in their collections, the museum is also widely recognized as Gedung Arca (Statue House). 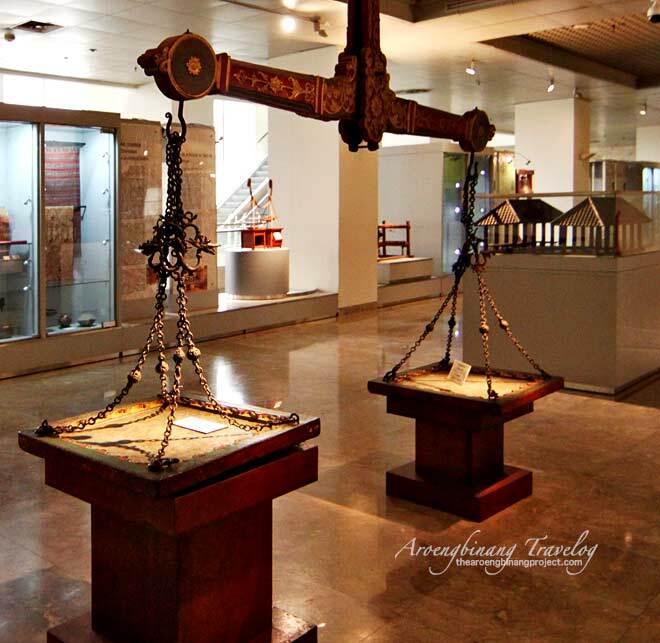 Meanwhile, among the collection of the National Museum is Numismatic coins such as gobog from Majapahit Kingdom era (between age 13-16th century), paper money and tokens, stamp from Palembang dated 1876 AD, as well as money printing equipment from Aceh who dated 1851. The National Museum is a huge museum complex with so many valuable and rare collections. You will be blown away when seeing the collection with your own eyes. When I visited the last time, the National Museum was planning to open a third floor that will specifically be used to display a collection of objects from different ethnic regions in the archipelago. 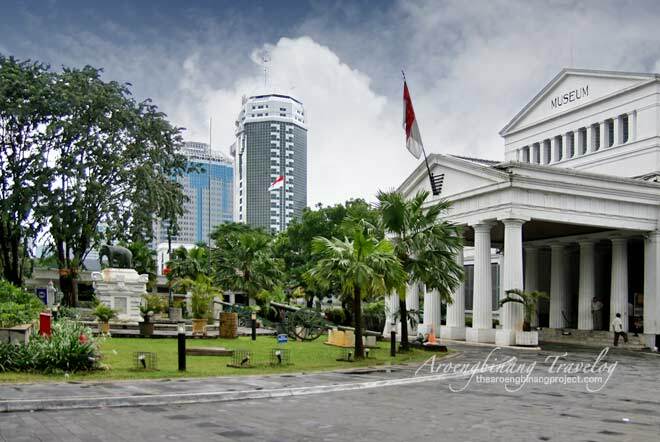 Location National Museum Jakarta is accessible either with private vehicle or public transportation. The museum is very close to the National Monument, Inscription Park Museum, and is on the direction towards Old Town if using Transjakarta bus from Blom M to Kota. Address: Jl. Merdeka Barat 12, Central Jakarta. GPS Location: -6.176162, 106.822418, Waze. Phone 021 3868172, Fax: 021 3447778. Open Tuesday to Friday 08.00-16.00. Saturday-Sunday 08.00-17.00.d Close on Mondays an nation holidays. Entrance ticket Rp 5.000, kids Rp 2.000. Foreigners Rp 10.000. Tour guide 021-5725870. Destinations in Jakarta, Map of Jakarta, Hotel in Central Jakarta. Label : Central Jakarta, Jakarta, Museum, Travel.